I did not take a vacation last year, because I bought a house and basically all travel money went into down payments and repairs. I had photographed at Culebra's idyllic beaches only once, so I was pretty stoked when Alex contacted me for portraits at Flamenco Beach, and it was also my perfect chance to unplug and relax. 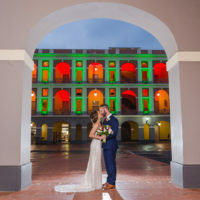 It was also the perfect unplug for Alex and John: they had a wedding during the first snowstorm of the year in their hometown, so they barely have outdoor portraits to remember their nuptials, and I think Culebra did them a great service with a perfectly sunny and warm beach day. I had spent the afternoon at Flamenco Beach, so when it was time to meet Alex and John for their portraits, I put a cover-up on top of my swimsuit and walked to the other end of the beach. Perfect commute! As you'll see in this set, their portraits were effortless! They broke the ice immediately, and I'm just in love with the beautiful collection of photos I was able to do for them. When we were close to the sunset, we went into the water for one last set inside the pastel green sea foam. Congratulations to the newlyweds and I wish you a beautiful, and happy life together!